When you started 2016, chances are you had some goals and ideas in place for the year ahead. What are you still working toward, and what did you achieve? Did you set larger plans in place that you need to continue striving for? Also take some time to review your spending and savings, so you have a good idea of where your money went this year. Look at where you achieved and where you fell flat, and use that to set a game plan for 2017. The way you allocate your assets can make a huge difference on your returns over time, so it’s important to check up on how your portfolio is balanced. Check it over to make sure you have a healthy combination of higher and lower risk investments, and that your money isn’t weighing too heavily to one asset. While you’re checking on your other benefits at the end of the year, you should also take some time to see who you’ve listed as a beneficiary. This is especially important if your company has changed its 401(k) provider, or if you got married or divorced within the past year. Check up on your retirement accounts and life insurance policies to verify that the correct names are listed on those accounts. You need to max out your retirement plan by December 31st, so if you haven’t done so, now is the time. You might receive an end-of-year bonus from works to add to that account, or shift some of your savings. Maxing out your 401(k) not only helps you save for retirement – it also cuts costs on your taxes, so it’s worth doing if you’re able to hit that limit. The holidays offer plenty of opportunities for you to give to charity, so whether you’re a once per year kind of person or there’s a cause you give to consistently, get your donations in by the end of the year. If you hit that deadline, you may be able to deduct those donations on your 2016 taxes. Tax loss harvesting means selling off investments that are worth less than they were when you bought them. This process allows you to save some money on your tax bill – typically a write off of $3,000 per year against your income. Just think carefully about what you’re selling off; if you sell something, you won’t be able to purchase it again right away because of wash sale rules. Don’t wait until spring to calculate your tax bill. Most of your opportunities to save on taxes have to be in before year’s end, and you might need that extra time to prepare for the cost. If this year’s tax bill is looking heftier than you thought, you still have time to cut down on it a bit. If you planned to give to charity, get your donation in before January 1st. You can also contribute to pre-tax accounts like Health Savings Accounts (HSA) or your 401(k). Knowing your tax bill amount ahead of time also buys you some time to budget for that payment when April rolls around. 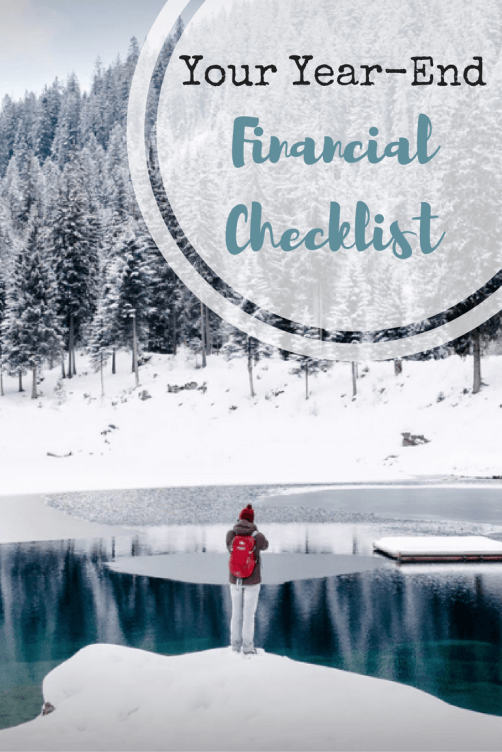 As you’re going through your year-end financial checklist, look at what you will need to do next year to hit your goals. What did you do well this year, and what could you have done better? SMART goals are specific, measurable, action-oriented, realistic and bound by a time limit. So instead of setting a vague goal to save more money, you should set specific goals that incorporate a plan to get there. Going through your finances at the end of the year gives you a good starting point to build those goals from. This will help you stay focused as you kick off a brand new year.